It's time to link up again with Doodle Bugs Teaching for Five for Friday, er, Saturday Afternoon. What can I say, punctuality has never been my strong suit! Here's what I was up to this week. Anyone else notice it was a full moon?!? When THIS happens right in front of your face...at 12:30 in the morning...after 2 overtimes...when you've been awake since 5:00 the previous morning...it doesn't make you want to get up early and knock out a blog. Grrr... It's not over yet, but I'm not a happy hockey fan today. Surprise! We had another "field trip" to the patio this week while my room was used by another grade for testing. Once again, we lucked out with some beautiful weather, so we made the best of it. We always have about 15-20 minutes of silent independent reading or writing in the classroom in the morning, so I figured why not do that while enjoying our surroundings? There were no visits from the sprinkler man today ,so we finally got to do our Nature Walk activity that was a big, fat #fail last week! We are also knee-deep in our 3rd grade portfolio assessments, which is the assessment-in-case-they-don't-pass-the-other-assessment-that-we-do-before-the-absolute-last-I-promise-assessment. Each part of the portfolio (there are 8 parts) consists of a short multiple choice test and a performance task. Most of the task have been pretty meh so far, but the kids really got into the one we did this week! After reading a few different articles, they had to show they understood the different characteristics of vertebrates and invertebrates by pretending they had discovered a new animal and writing a newspaper article about it. There were some great names like the Unafox, the Flyeder, Spinoraptor Rex, Unisaurus, the Flying Crabfish...and my personal favorite, the Beeble (a bee mixed with a beetle)! I have some great artists in this group! Grumpy Gus: He looks like a cat, not a rabbit. Me: You are correct. It's not the best picture. Grumpy Gus: And why is it such a wonderful day, anyway? Me, trying not to laugh: Ok, let's read to find out what Roger does when he finds this cabbage. Grumpy Gus: He's going to take it home, but it won't fit in his house, so he's going to have to eat some of it to make it fit in the door (he may be Grumpy, but he displayed excellent critical thinking skills there...and was about 98% accurate). Me: You might be right about that. Read until you see the star. "What?" I asked him as he bent over laughing. "That just don't look right," he replied. I can't say I disagree with him! Hey, there's worse things to be addicted to than stationery! That's it for me! 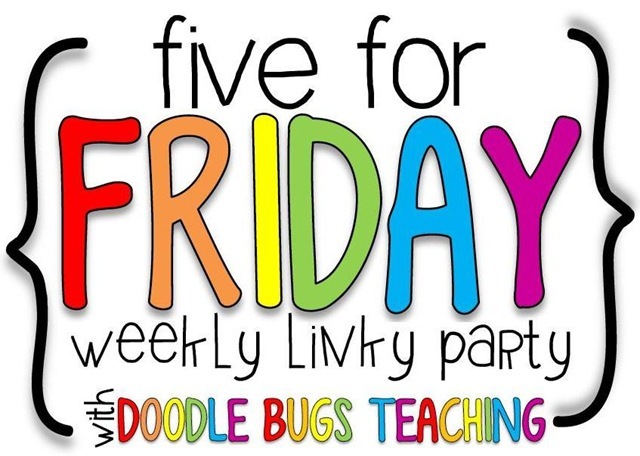 Make sure to visit Doodle Bugs Teaching for the best link up of the week! I love the writing the kids did! I wouldn't mind seeing a Unisaurous! OMG! Grumpy Gus sounds like my Crabby Chris. That was hysterical! I'm glad you could find humor in his comments. At this point I really just have to laugh...or lose my sanity!